A Robust, Compact Instrument for Automated Cell Analysis. Muse® cell Analyzer is highly intuitive flow-based instrument which has been specially designed for your daily need of fluorescent based-cell analysis in an economical way. It can be kept inside your culture lab for an immediate assessment of recently tripsinized cell culture for their cell counts and highly quantitative analysis of cell health parameters. The instrument is robust, easy to maintain and very easy to use with its pre-defined easy-to-follow guided menus on its touch screen and its pre-optimized Mix and Read assay kits. Muse® Cell Analyzer is based on patent-pending, miniaturized fluorescent detection and microcapillary technology to deliver truly accurate, precise and quantitative cell analysis. The use of novel microcapillary technology and miniaturized optics in the system eliminates the need of sheath fluid thereby making it easy to maintain and cost effective. It is embedded with a highly intuitive touchscreen interface that allows simple step-by-step operation which requires no expertise to follow and run the assays. 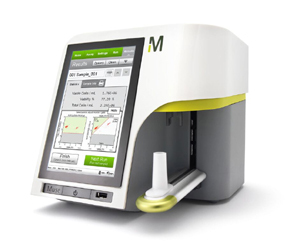 The Muse® Cell Analyzer counts cells and measures viability more precisely with smaller coefficients of variation (%CV) than manual hemocytometry or image-based automated analysis The compact footprint of the system makes it portable and requires minimum space in the lab. Highly intuitive software interface and sensitive touch screen with guided menus to generate data output designed for each experimental application. How to set up your Muse Cell Analyzer? How to run system check on Muse Cell Analyzer? How to run samples on powerful Muse Cell Analyzer?